Three volunteers stepped out of China's Lunar Palace 1 last month after a 105-day shakeout mission — not on the moon, but on Earth. Munching on protein-rich mealworms and other delicacies, the trio of Chinese biospherians carried out the first long-duration multicrew sealed cabin research in the country at the Beijing University of Aeronautics and Astronautics. The facility is a 500-cubic-meter capsule that covers an area of 160 square meters and consists of one integrated module and two plant cultivation modules. The integrated module includes a living room, a work room, a bathroom and a waste-disposal room. Experimental crops, such as corn and peanuts, were grown during the test, as were lentils and cucumber vine plants. Human waste was handled within the Lunar Palace 1 by a biofermentation process. Food residue and other byproducts were treated by biotechniques and were used for plant cultivation. The three-person team comprised two women — Xie Beizhen and Wang Minjuan — and one man, Dong Chen, all from the Beijing University of Aeronautics and Astronautics. The Lunar Palace 1 project started in March 2013 with system construction, followed by the commissioning of the facility, leading up to the 105-day mission that ended May 20. Wang Minjuan, one of three Chinese "biospherians" to live 105 days within the Lunar Palace 1. Officials from the China Manned Space Engineering (CMSE) office said, "The success of the experiment has laid [a] good foundation to CELSS [the controlled ecological life support system] flight demonstration tests for China's space station, which will be helpful for China's astronauts to get fresh vegetables, improve their living conditions and relieve their mental stress." 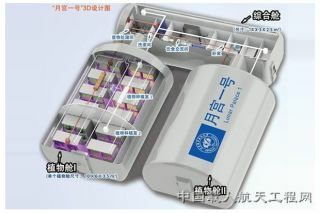 The core of Lunar Palace 1 is the world's most advanced closed-loop life-support technology so far: a Bioregenerative Life Support System that is essential for astronauts to live and work in space for long-duration missions, thus making it possible for lengthy spaceflights and planetary exploration, representatives wrote on the CMSE website. A story posted on the CMSE website says Lunar Palace 1 is the first bioregenerative life-support base developed in China, and the third overall in the world. "The success of Lunar Palace 1 research indicates that China has been among the most advanced in the field of bioregenerative life-support research, which will play a significant role in China's future missions like [a] manned moon landing, lunar base establishment, Mars exploration," the website states. Chief architect of Lunar Palace 1, Liu Hong of the Beijing University of Aeronautics and Astronautics. "I think the biggest significance of this system is the ability to provide the necessary theoretical basis and technical support for a lunar base," Liu Hong, chief architect of Lunar Palace 1 and a professor of biological and medical engineering at Beijing University of Aeronautics and Astronautics, said. MIT's Larry Young is a research scientist that has been focused on life support issues facing astronauts on long-duration space travel, particularly the use of artificial gravity. Last year, Young took part in a China-sponsored space life sciences meeting and got a first-hand look at what that country's top experts are considering in terms of their future space exploration activities. "China's Lunar Palace 1 gives an entirely new meaning to 'Chinese takeout,'" said Larry Young, Apollo program professor of astronautics and professor of health sciences and technology at the Massachusetts Institute of Technology in Cambridge, Mass. Only with an efficient, fully closed biologically regenerative life-support system can we seriously move forward with an anticipated human Mars exploration, Young told Space.com. "We still have a long way to go before space crews can live entirely on food raised in their onboard gardens," Young said, "but this long journey has, as Confucius might have said, started with the first step."